A scary new environment, full of strange sounds and smells can be terrifying for a cat. When cats are scared they try to appear as small as possible, and they shrink and cower in the back of their kennels. A cat who is scared is less likely to be adopted into a loving home, and sadly, stress is a major cause of disease and death in shelter cats. 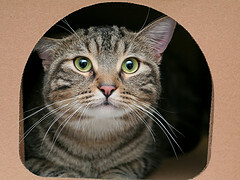 To help reduce the fear and stress, the OHS provides hide and perch boxes so a cat can retreat to a safe cubby and perch to see what is going on. The box goes home with the cat upon adoption to ease transition to the new home. One hide and perch box will provide a cat safety, security, and a calm stay at the OHS, helping to ensure a new life in a loving home. There are so many stressed cats in our overcrowded shelter. Keep 15 cats healthy for only $25.